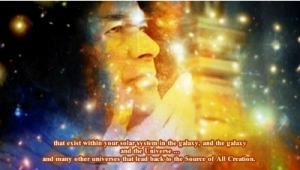 Valerie: It is Tuesday, April the 5th 2016, and we are calling upon Cosmic Sai Baba to make His presence. And we ask him with respect to bring His message today. And we welcome him with love. Thank you. ❝I am here! And I am very pleased to be here – I have been here for some time and listening. And I am very pleased with the knowledge, that you all have, and the wisdom – and the choices that you make also – about living your lives. It is good; it is good. And I know that you are here to serve with us; you serve God, and we welcome that. Because we can then work easily with people such as you – all you need to do is call upon us – please remember that! Please remember that. My message today is not that much different from the messages I have been giving … very recently. It is a time of challenge; it is a time to think about who you are and why you here and how you can change that. So my message is not very long today, but rather, to encourage you to continue to work within yourself, and look within rather than outside, for any reactions you have – and then think about the (negative) emotions – and ask for that to be taken away. And to look at what it is you react to, and why you react to something. For if everybody did this upon this Earth – just imagine – if they did this – all together at the same time – there would be Peace. Because everybody would stop reacting. It is the emotion that is within you, that is causing you problems, problems within your soul – and problems around you – for like attracts like. If you are upset, it somehow attracts another upset person. If you are angry, it attracts another angry person. But this can change. If you can deal with your emotions, and ask that God within you to take that away from you; and then look at why you react. You can find some understanding within you – what it is and why you are reacting. And if it is not taken away soon, easily, then you can ask God to give you some insight. Which means you need to sit for a little while, for say ten minutes or so in a meditation – in a meditative state – and ask why it is that you react. Thoughts will come; ideas will come! Intuition will come (which is inner teaching). All these things are within you, to help you. You will receive images, sometimes. Or even a voice may speak to you. For that is good. Welcome that! Do not be afraid! For everything that is within you is of God, who is within you. Remember that. There is no need to be afraid, ever! You have that strength within you, you have courage within you to deal with anything that is put in front of you, or behind you or beside you. It is an opportunity to grow. It is an opportunity – perhaps – to share with another. Or to assist another. There will be a reason and a purpose for everything. There always is. So I would like you to just think about that and work with it. It is important. You have the ability to do this, to heal yourselves. This is where everyone needs to start. It is the New Frontier. That is one way of putting it. A new frontier for everyone. To look within you if there is a problem; not without. But why it is attracted to you (the problem) it is for a reason … it is to help you to understand, it is to teach you … you can learn from it … you can understand, you can change things that react to you. You can ask for the God within you to change that. It is possible; and it is very easy – it is the reality of who you are, it is the gift you have been given: this is what you are born with – a Soul – and the centre of a Soul is God. That is who you are … so please do not forget this. Look within you, my Children, the answers are there! Ah, yes! The answers are there! Thank you! Thank you for listening to me. And everybody with God within – is blessed – and can give blessings in return. Like attracts like, remember that.